Simon Hardimé was born in Antwerp in 1664 and was a painter of floral still lifes. His floral arrangements are lush and arranged nonchalantly, usually placed in a reed wicker basket or standing in a vase. 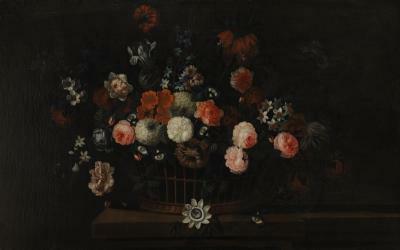 Some flowers in particular works can be found in the exact same position in other still lifes by his hand, indicating that Hardimé made sketches of the different kinds of flowers and a . . .